Iowa–Grant junior Kenzie Oakes pulls up for a jumper during the Panthers’ 45–45 win over visiting Fennimore last Friday night. POSTED December 6, 2018 11:16 a.m.
MIFFLIN — Sophomore Logan Hubbard’s clutch free throws with 30 seconds left lifted Iowa–Grant to a 45–44 conference victory over visiting Fennimore Friday night in the Southwest Wisconsin Activities League opener for both teams. Fennimore had three chances to regain the lead in the final half minute, but the host Panthers survived for a one-point victory. 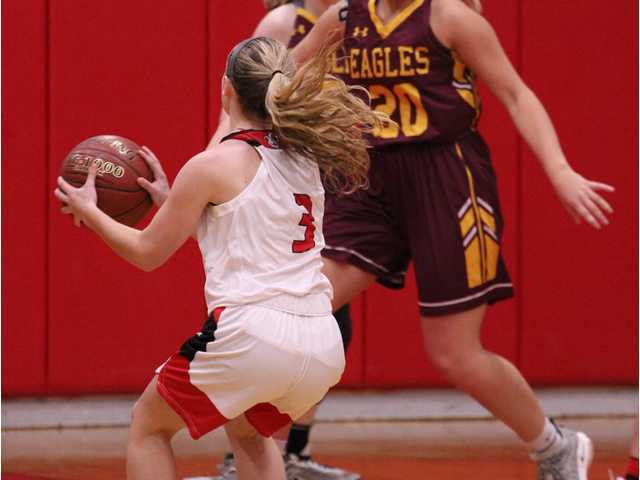 Fennimore sophomore Brynlee Nelson got a steal and layup to the Golden Eagles up two, 44–42, with a minute to play. I–G junior standout Olivia Liddicoat drew a foul on the ensuing possession. She made the first free throw and missed the second, but got her own offensive rebound and Fennimore eventually fouled Hubbard on a drive. Hubbard calmly sank both for her ninth and 10th points of the night. Nelson missed a good look from free throw line on Fennimore’s next trip down court. The Eagles grabbed the offensive rebound, but turned it over seconds later. Fennimore had to foul, but I–G left the door cracked open when Oakes missed a pair from the line with 15 seconds to play. The Eagles had one final shot to steal the victory, but Nelson’s floater from the free throw rimmed out. “It’s nice to start with a win in conference,” said Iowa–Grant head coach Dan Liddicoat. “There is a lot of basketball to be played so we’re going to keep working hard in the gym. Liddicoat finished with a team-high 16 points, nine rebounds, three assists and three steals to lead the Panthers. Spurley had 11 points, four rebounds and two assists, and Hubbard added 10 points and three rebounds. Oakes chipped in six points, three rebounds and three assists. Nelson scored a game-high 19 points to lead Fennimore (2–3, 0–1 SWAL). Iowa–Grant dropped a 50–38 conference decision to visiting Boscobel on Monday night. Hubbard led the way with 14 points in the loss as the Panthers fell to 2–3 overall and 1–1 in the SWAL. Iowa–Grant will travel to Mineral Point on Tuesday night. Fennimore (1–3, 0–1) — Alexis Adkins 4, Brooklan Schoepp 2, Brynlee Nelson 19, Mariah Kopp 2, Claire Faulkner 2, Drehya Dresen 1, Ashley Lang 14. Totals – 18 3-6 44. Iowa–Grant (2–2, 1–0) — Kenzie Oakes 6, Olivia Liddicoat 16, Logan Hubbard 10, Annie Spurley 11, Taylor Runde 2. Totals – 18 8-11 45. 3-point goals — F: 5 (Nelson 3, Lang 2); IG: 1 (Spurley 1). Total fouls — F: 16, IG: 10. Fouled out — F: Adkins. Boscobel (2–2, 1–1) — Katlyn Seeley 2, Shawna Newton 2 Sarah Knowles 6, Jayce Zimple 3, Erin Beck 7, Leah Wacker 17, Treena Knowles 13. Totals – 20 5-10 50. Iowa–Grant (2–3, 1–1) — Kylie Cutts 2, Kenzie Oakes 3, Olivia Liddicoat 11, Logan Hubbard 14, Annie Spurley 6, Taylor Runde 2. Totals – 16 4-10 38. 3-point goals — B: 4 (Beck 1, Wacker 4); IG: Hubbard 2. Total fouls — B: 11, IG: 16. Fouled out — IG: Liddicoat.